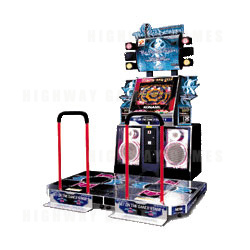 Dancing Stage featuring True Kiss Destination is the first "Dancing Stage" title of the Dance Dance Revolution series in Japan. While the Dancing Stage moniker has been the alternative name for the Dance Dance Revolution series in the European region, a handful of DDR games in Japan also feature this title. The Dancing Stage games in Japan all deviate away from the main DDR series of games and in True Kiss Destination case it featured a themed set of music by the Japanese group of the same name as well as original music from Konami's in house artists.